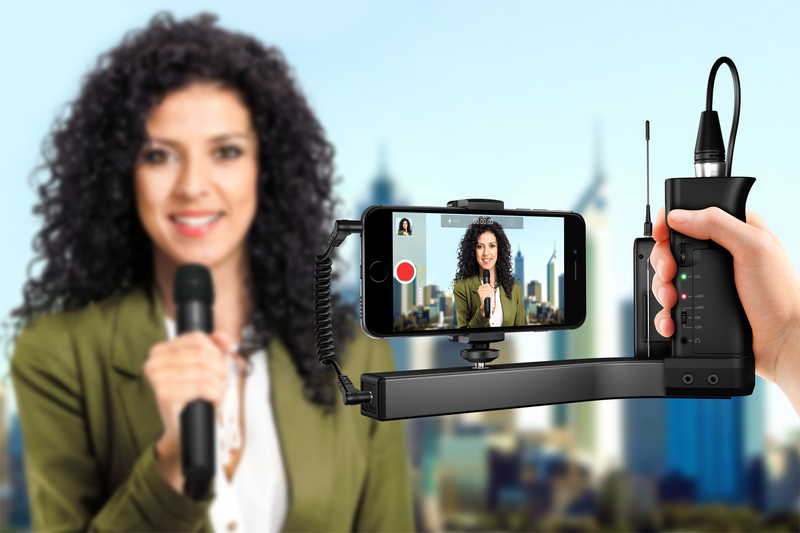 IK Multimedia has released a new mount, the iKlip A/V, that allows users to capture pro-quality audio when shooting video, turning your smartphone into a full-featured broadcasting solution. Last year’s Sundance breakout film Tangerine, shot entirely on an iPhone, has shown that recording films on your smartphone can be an inexpensive alternative for many indie filmmakers. Or even as a cost-effective way for smaller broadcasters or online news sites to shoot ENG or field reporting. However, your phone’s 4K video recording doesn’t usually record pro-quality audio, unless you own the new HTC 10 (which does feature 24-bit audio capture), this is where the iKilp A/V will be really useful. Designed in Italy, the smartphone mount features an XLR input with 48V phantom power, with an integrated microphone preamp, allowing users to record audio with high-end external condenser microphones. 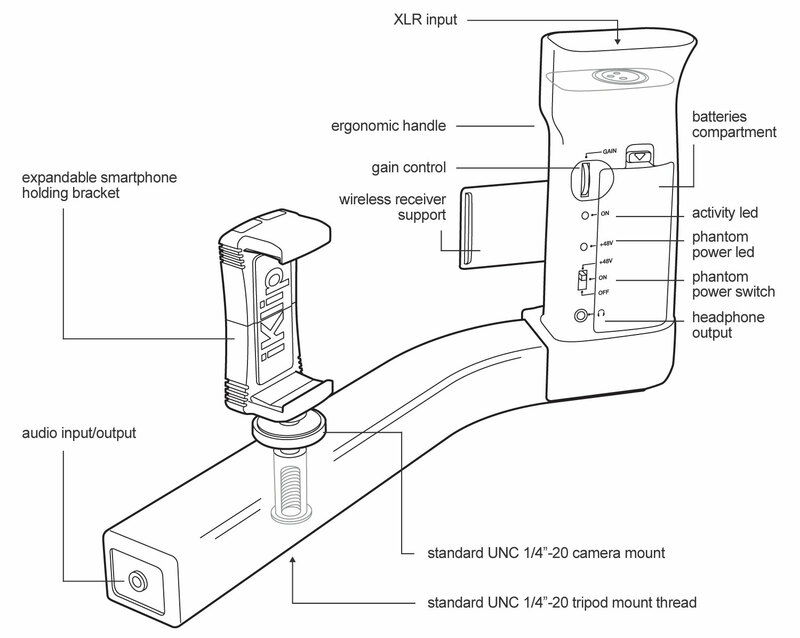 Along with a built-in support bracket that can hold most popular wireless microphone receivers. The 48V XLR input is powered by two AA batteries and features gains control, headphone monitoring output and a 1/8″(3.5mm) TRRS (CTIA/AHJ wiring standard) audio output for external recorders – or to plug into that fancy new HTC 10 – or any other smartphone you might have laying around. Other features include an ergonomic handheld grip and an expandable smartphone holding bracket, allowing users to securely hold any smart device with a screen size from 3.5″ to 6″. It also has standard female threads on the underside so it can be attached to any monopod or tripod and the smartphone holder bracket can be detached, to create a standard mount for compact video cameras. An optional iLine Camera Adapter cable is available so the mount can be used with any camera that has an auxiliary microphone TRS input. 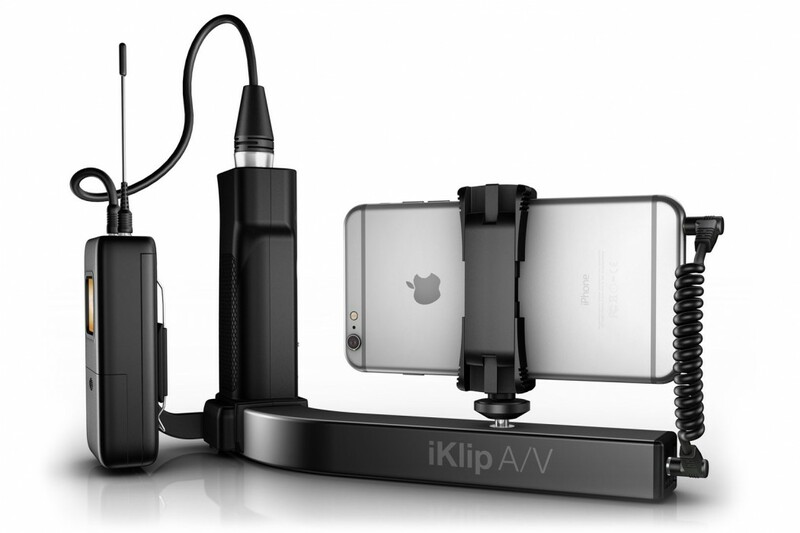 iKlip A/V is available now from photo/video, music and electronics retailers worldwide, and from the IK online store, for $/€179.99 (excl. taxes).